KBV2 is not exactly for those who cottoned to Titanic. It isn't even for everyone who liked the first volume. This is strictly for those who either carouse in Tarantino's work or loathe him with a passion. Or for those who, simply, have an appreciation for a movie well-made. Volume 2 is intriguingly perverse. Tarantino's characters are a curious blend of ruthlessness, depravity and sympathy, and he showers careful, loving attention on all of them. Chapter 6 opens with The Bride (Uma Thurman) still coxswaining along her retribution trail, weeding out those who wronged her. Tarantino re-introduces Budd, only this time as a former assassin who is now reduced to cleaning out clogged toilets at the empty strip-club where he works as a bouncer. And as the guy who believes that The Bride deserves her revenge, but who would gladly help her over a cliff. Or over the edge of a freshly dug grave. And when she lies there in the grave, gasping and panting furiously for air, Tarantino cleverly changes the aspect ratio from cinemascope to television shape, compelling the audience to feel the constrained, confined, claustrophobia. And then he demonstrates, brilliantly, how he can play with time frames, and how chronology is of little importance if there is a master at the helm. As the heroine lies in her grave, Tarantino takes you back to the time she was training under the Kung Fu great, Pai Mei. 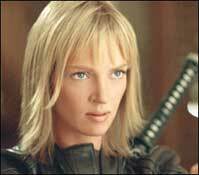 As The Bride surrenders completely to Master Pai Mei, no ego, no humiliation, just the will to learn, you realize that it is, on many levels, the submission of Uma Thurman to Master Tarantino. She resurrects herself from the bosom of the earth, and sets out to bump-off Budd, only to find that her nemesis, Elle Driver (Daryl Hannah), has beaten her to it. But after the showdown between the women, The Bride only has one remaining mission: to kill Bill. The story, when narrated, might seem frivolous, but is something that you drift along with nicely; deeply interested, yet, curiously, unattached to the characters. The encounter with Bill is anti-climactic, but not deus ex machina. The affectionate scenes with their daughter BB are amazingly transformational for the characters, and the transformation itself, from cold and calculating to warm and vulnerable, is disconcerting. But will she kill Bill after the moments of tenderness? Almost surprisingly, through and despite the affection, both of them are gunning for each others' blood. And when she succeeds, you feel her grief as she mourns for the father of her child, the man she loved. The build-up to the moment of action, throughout the movie, is almost enervating; the payoff at the end, however, is small. KBV2 is, in patches, morbid, but never about a gore-fest. A lot of people would, perhaps, be a trifle disappointed with the 'simple, quick' manner in which Bill is slain, but that, in so many ways, is Tarantino. You want to hear what he has to say, even if it isn't what you want to hear. ofcourse she will kill bill!! fullhyd.com has 700,000+ monthly visits. Tell Hyderabad what you feel about Kill Bill 2!